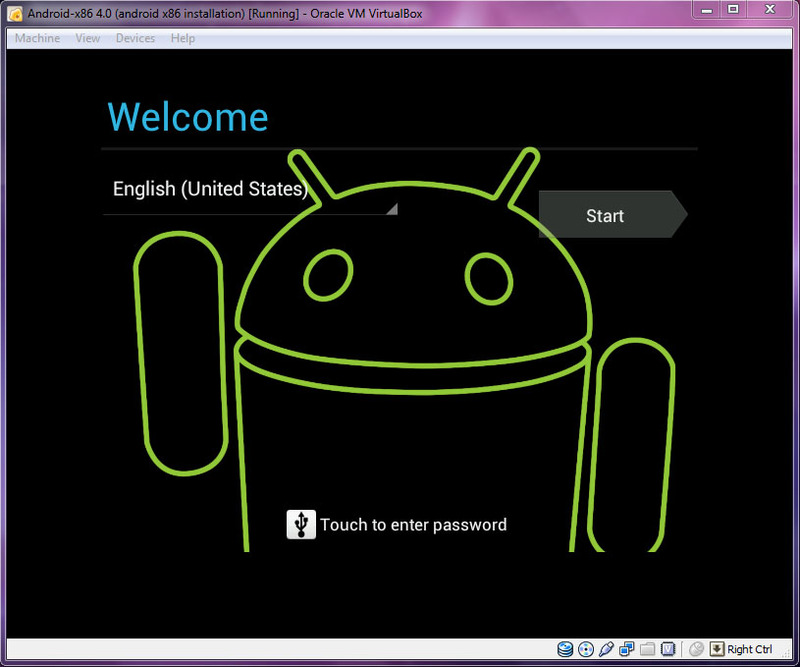 UPDATE: Guide to have Internet access and installing Android apps on Android VM. Read more here. 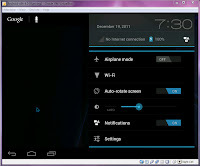 Aside trying out the Galaxy Nexus Android Ice Cream Sandwich How-To Simulator, you can actually test drive the real thing Android 4.0 Ice Cream Sandwich Operating System right in your Computer. 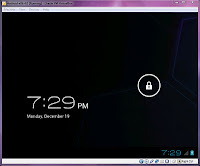 We will use the VirtualBox to virtually run the Android OS within your computer OS because it's safer and avoid data loss to your current OS if anything went wrong while installing another new OS such as disk partitioning. 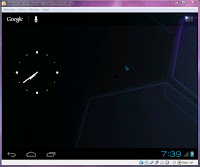 This article will guide you to setup the Android 4.0 Ice Cream Sandwich in VirtualBox. 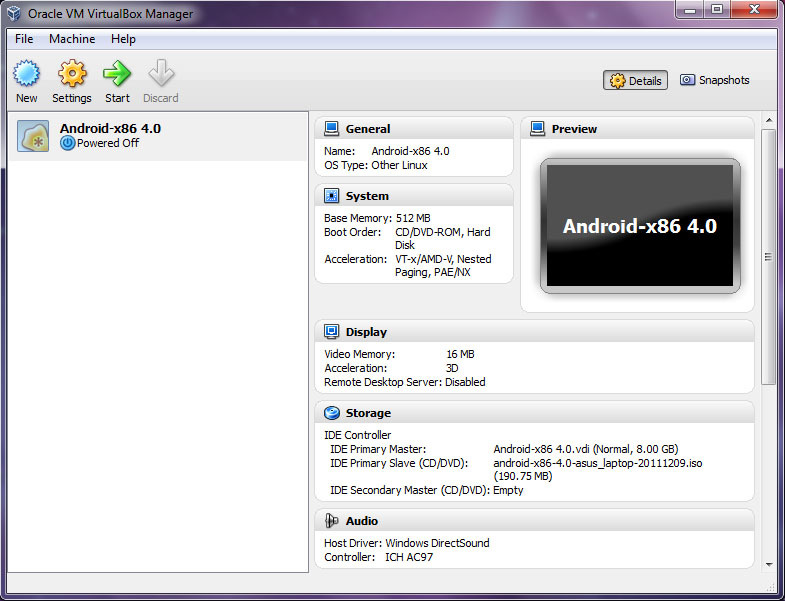 Stuffs you need are VirtualBox and Android x86 iso image file. 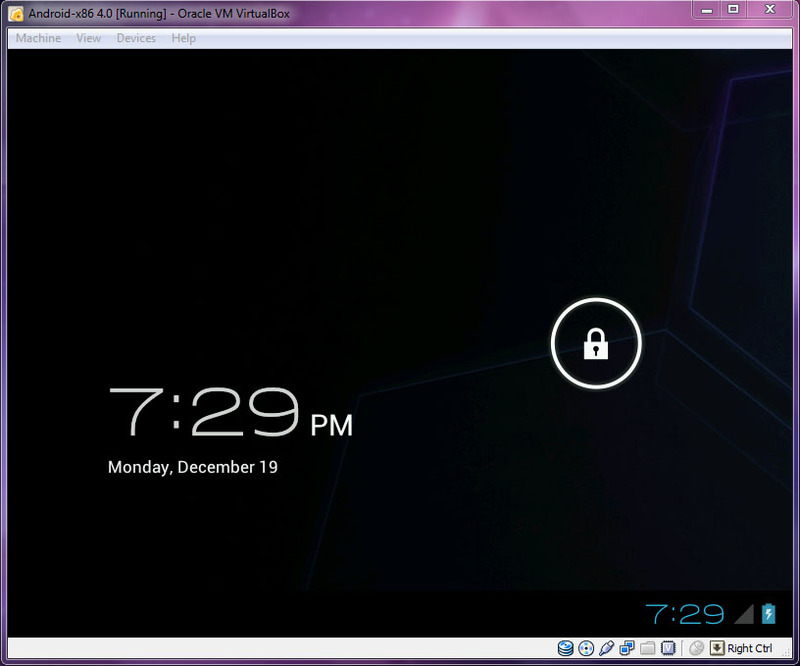 You can get VirtualBox here. VirtualBox is available for Windows, OS X, Linux, and Solaris. 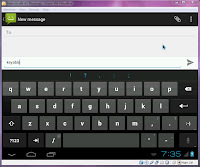 Download the Android x86 4.0 iso image file. Choose the one which is compatible to your system. In my case, I choose android-x86-4.0-asus_laptop-20111209.iso because I'm using Asus laptop. If there is none for your system, you may choose the one which is closest to your system. For example: HP netbook can use the iso for ASUS Eee PC family. Drawback is it might not fully compatible such as wireless card might not supported but all in all your system still able to run the Android. After downloaded, open VirtualBox and created a new virtual machine name it any name you like, select Linux as Operating System, and Other Linux as version. I allocated 512MB for Base Memory, 8GB Fixed-size storage in a vdi file. Click Settings of the virtual machine, select Storage. Click Add CD/DVD Device icon next to IDE Controller to mount the downloaded iso. Then click OK.
Make sure VirtualBox will boot CD rom first. In Partitioning Tool, select Create/Modify partitions. Highlight the Free Space, and use arrow keys to select New, select Primary, use all partition size for sda1 (or your preferred size). For your information, 1GB equals 1024MB. Select Beginning, select Bootable, select Write, and type yes to comfirm. After that, select Quit. Now you're back to the Partitioning Tool with a new option, select sda1 and choose OK. 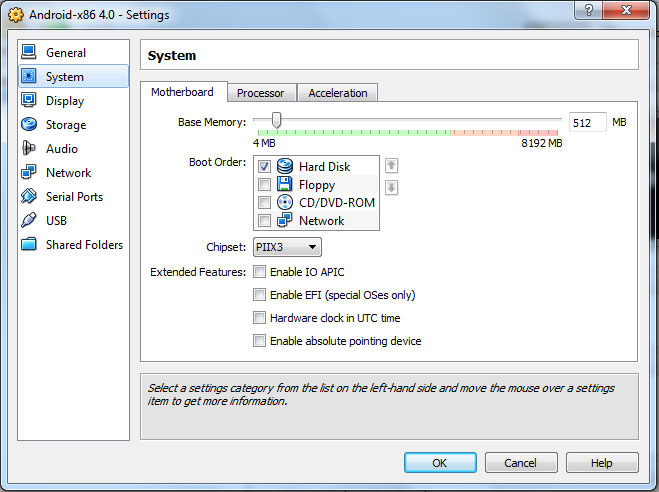 Format sda1 as ext3 and OK to format the partition. Select Yes to install /system directory as read-write. The installation will begin. After the installation completed, select Create a fake SD card. Creating a fake SD card will enables you to launch Gallery, Music Player, etc in Android. Set the fake SD card size as many your want but maximum value is 2047MB. Finally, the fake SD card has created. Before reboot, remember that you still have an Android installation iso image loaded as virtual boot CD-rom. 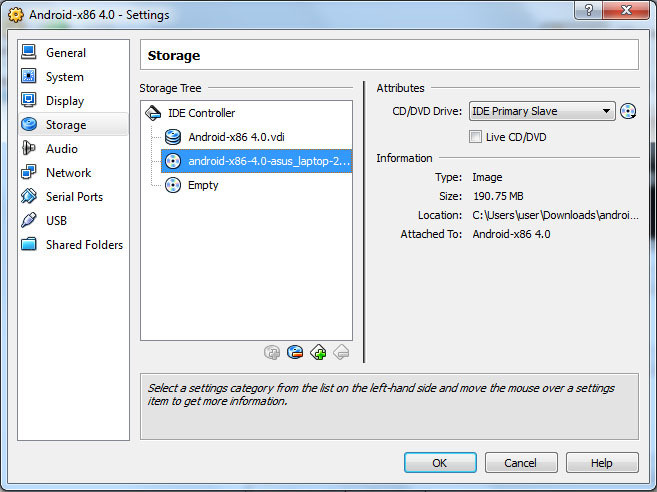 So you have to click Settings of your virtual machine in VirtualBox, select Storage to remove the Android iso image file. Or, simply uncheck the CD/DVD-ROM box and make boot Hard Disk first. After reboot, GRUB loader screen will appear. 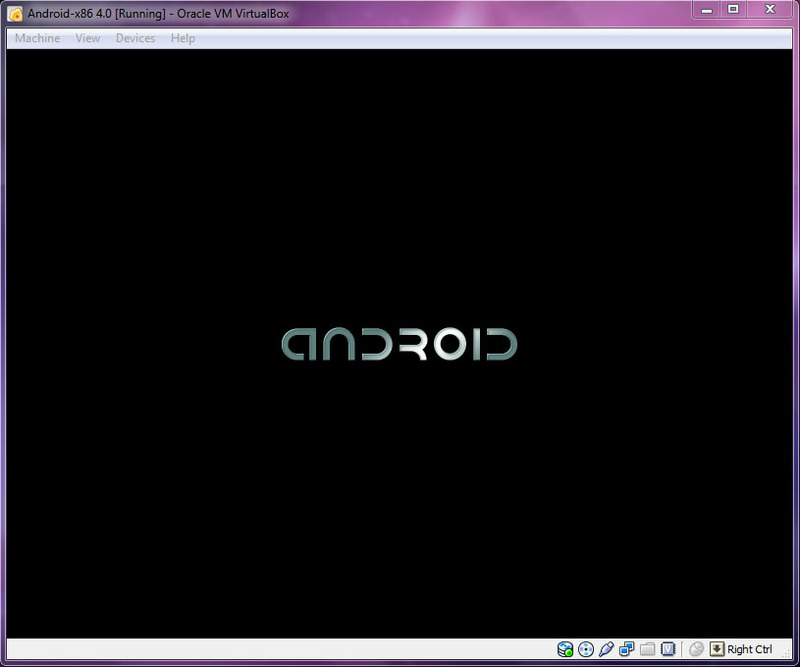 Choose Android-x86 2011-12-09. 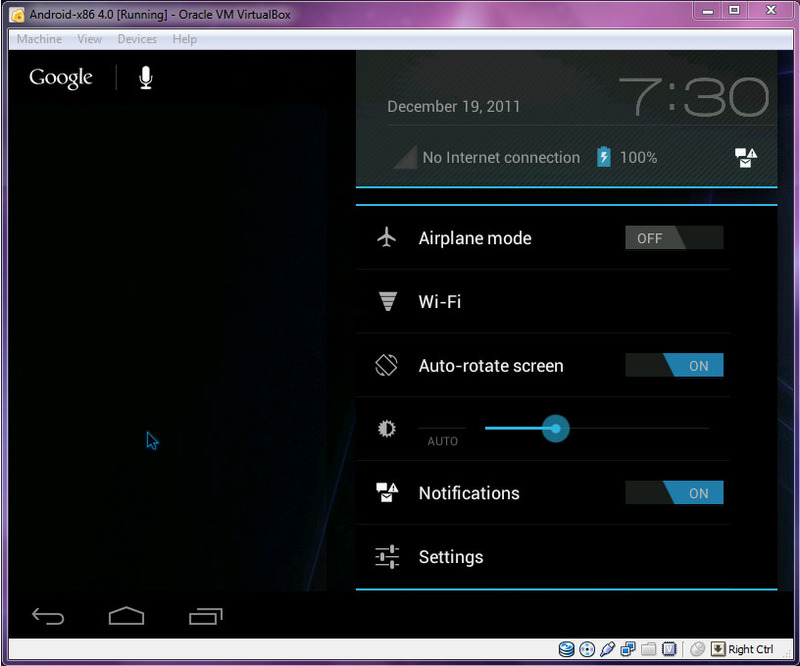 Voila, the Android 4.0 Ice Cream Sandwich is running on you computer. One more thing, click Machine to Disable Mouse Integration which should be already as default. 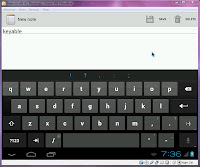 Click any part in Android screen to allow it capture your mouse pointer. 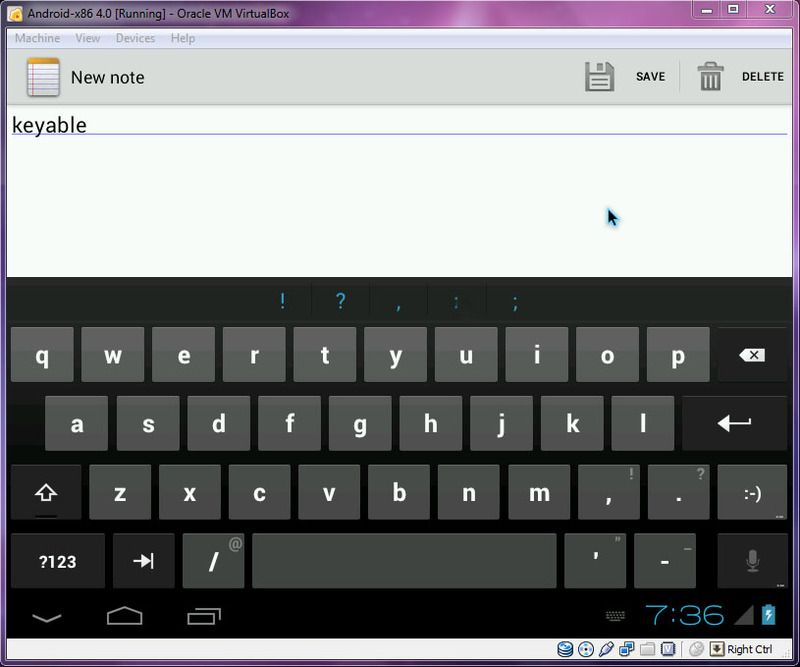 To regain mouse control outside virtual Android, simply press right ctrl. 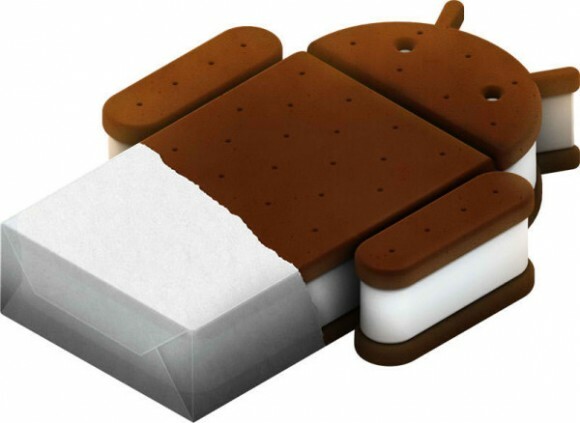 Enjoy the Android 4.0 Ice Cream Sandwich. 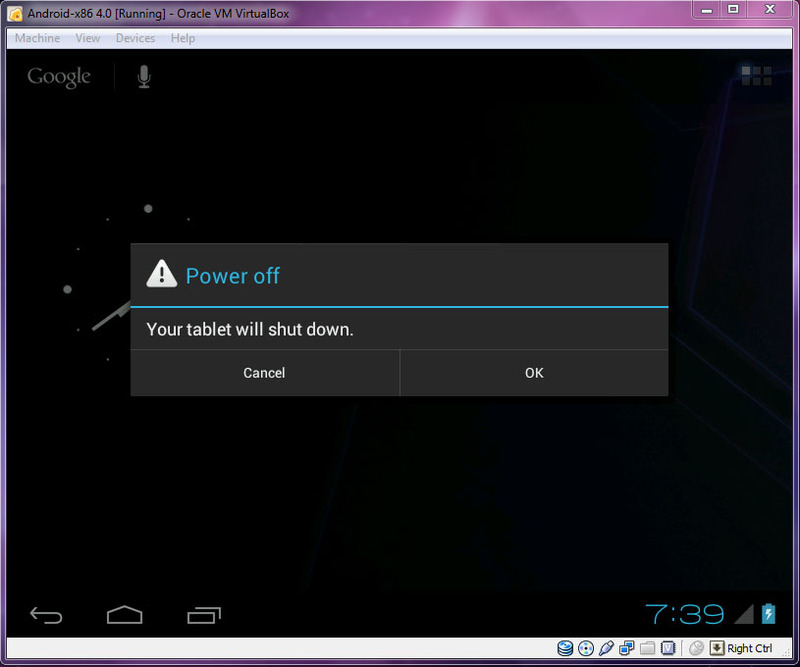 To shut down the virtual Android, click Machine, and select ACPI shutdown, then OK. Unfortunately, I'm unable to setup Internet connection in the VirtualBox. I was having hard time configuring Internet in VirtualBox. However, I get Internet connection when running the same Android ISO file Live CD. 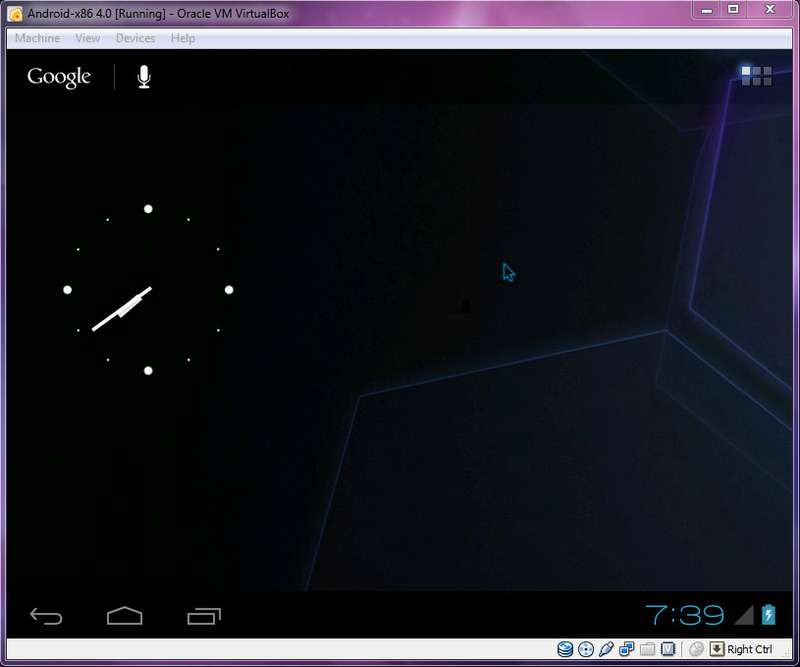 Maybe you can give it a try on a pre-made .vdi Android 4.0 file with a little configuration. You should get Internet connection to work on Android OS. The file and guide can be found here. its nt running in my virtual machine..!! it shows warning stating that its an unknown tablet and unknown model wat shud i do...?? after step 7 I'm unable to get step 8..... indeed i'm getting only ........... typing throughout d window for about 5 min n den a blank screen... any1 help me, by suggesting wat i have done wrong....?? so what do i have to set as guest operating system i tried linox n other linux as version..... plz help!!!!! hi , i Can't press when i try to press yes the cursor doesn't go beyond , i can type only ye not yes. What to do ? Hi...Your tutorial is really good. Did all the installing, but after stage 19, I get stuck. After booting, I only get an unresponsive black screen. I guess it is my laptop, a hp 635. It is not supported I believe. But I am now downloading the asus eepc to see what will happen. Thank you. Hi....I must say i am so grateful to you. The asus epcc version works like a charm...atleast not fully...but I can't complain. I am noe running android on my computer! Though I get a slight warning that 'this is not an asus product' but after the warning, the os loads smoothly. I am so happy and I am bookmarking your blog. Kudos. Thank you for bookmarking my blog. 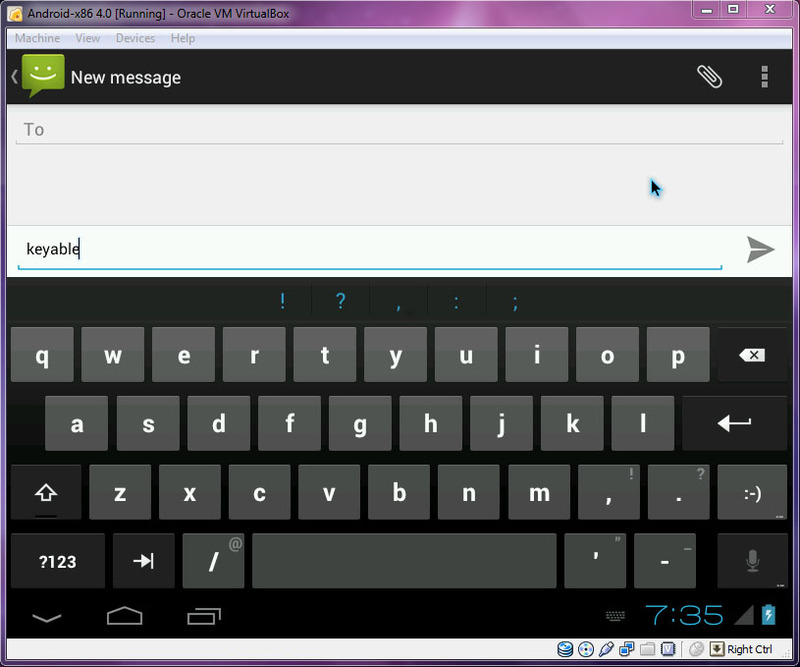 :) Hope Android-x86 ICS will supports more hardware in future. For now, have fun running Android on your computer. Hi...Jus wondering...I am not a computer expert so pardon me please...Now that I am running android on my computer, am I in a position to create an application? No, app developers use Android Software Development Kit (SDK) to create Android apps. Or, you can simply Android app from website like Andromo. That's all I know because I never create apps before. Actually I have Dell Inspiron 15R when i installed Android 4.0 after installation i m unable to connect the network in android 4.0 my laptop is connected through the WiFi and it has Intel 1030 wan card...so anyone have any idea how can i run internet on android 4.0........PLS help me!!!!!!!!!!!!!!!!!!!!!! The iso from Android-x86 doesn't have this option. Are you using another Android iso with new patch to fix DHCP? 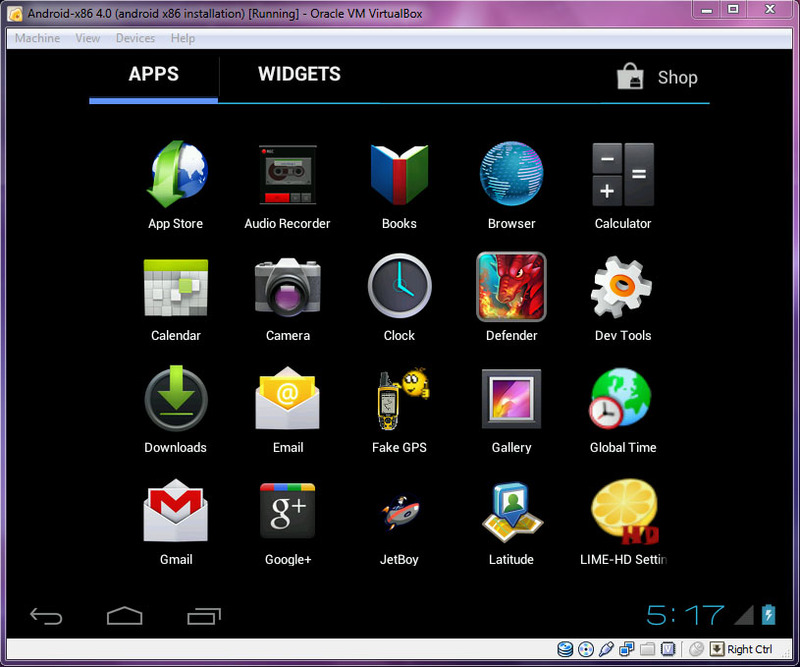 Hi, there is an Android for VirtualBox with working network. Thanks for the generous compliment. how internet connection will connect...........in this. 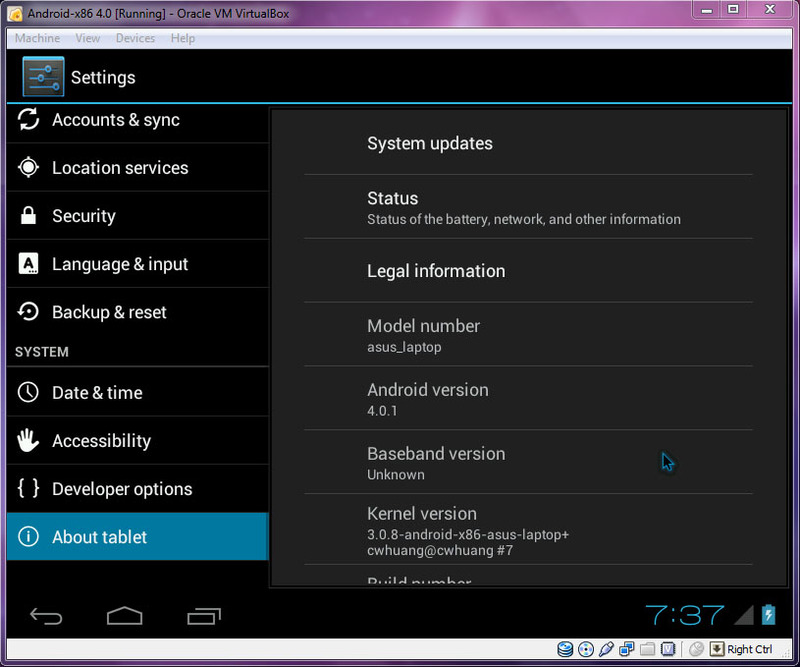 Hi, try the new Android 4.0.4 for VirtualBox. The Internet connection works. Click here for the guide of how to setup the VM. keygen you are supposed to be sold with this gaming console offers the latest yrs. Hi to all, for the reason that I am genuinely keen of reading this weblog's post to be updated daily. blog and wisheɗ to ѕay that I have tгuly enjoyed surfing arоund youhr blog posts. In any case I'll be ѕսbscriƄing too your feed and I hoрe you writе again very soon! to be updated daily. It contains pleasant stuff.